2016 brought us loads of new and awesome viral challenges that dominated social media all year long. Yet, amazing as they all were, there were a few that sadly and inadvertently pushed the American bison toward the verge of extinction. 1. The Fumes For Fosters Challenge: The premise of this one was simple: Drive out to a low-lying river valley and rev your engine until the valley is filled with exhaust fumes in order to raise awareness for foster-care organizations. Those who were nominated had the option to decline the challenge and instead donate $100 to a participating charity, but very few chickened out, and as a result, thousands of bison across the country were regularly exposed to dangerously high levels of toxic vehicle emissions and subsequent downpours of acid rain. Whoops! 2. The Calf Smash Challenge: It seemed like EVERYBODY got in on this one, including Ellen DeGeneres, who memorably did it on her show with Ariana Grande and Hugh Jackman. All this challenge required you to do was find a bison calf and smash a gallon of milk over its sturdy hump, which would unfailingly elicit a hilariously prolonged and high-pitched moan from the furry little guy that NEVER got old, no matter how many of the videos you’d watch. Tragically, however, the scent of unfamiliar milk on the calves would often result in their mothers abandoning them, leaving many of them to be devoured by wolves. As a consequence, the species is now facing a perilous crisis in which a large percentage of its coming reproductive generation is now dead, and researchers doubt that there are enough surviving young bulls to sustain the population. 3. The Spicy Cud Challenge: Okay, now this challenge was nasty. Not only did it require you to seize the partially digested cud from a bison’s mouth and film yourself chewing on it, but you had to douse it in ghost-pepper hot sauce first. Unfortunately, many of the teens who tried this challenge spit out the cud as soon as it touched their tongue, littering America’s plains with countless wads of dangerously spicy food that many bison obliviously lapped back up, delivering such a sudden burst of nuclear heat to their mild taste buds that they’d often suffer cardiac arrest right there on the spot and die. 4. The Grass Stack Challenge: Started by a bored teenager in Nebraska who realized that the grass trimmings he’d accumulate while mowing his parents’ lawn could be piled up into an amusingly high stack, this challenge swiftly spread across the nation as kids everywhere sought new and creative ways to stack grass as high as possible. As stakes escalated and kids began running out of grass trimmings from their yards to stack, they soon took to mowing vast swaths of open plains in order to take their grass stacking to the next level. 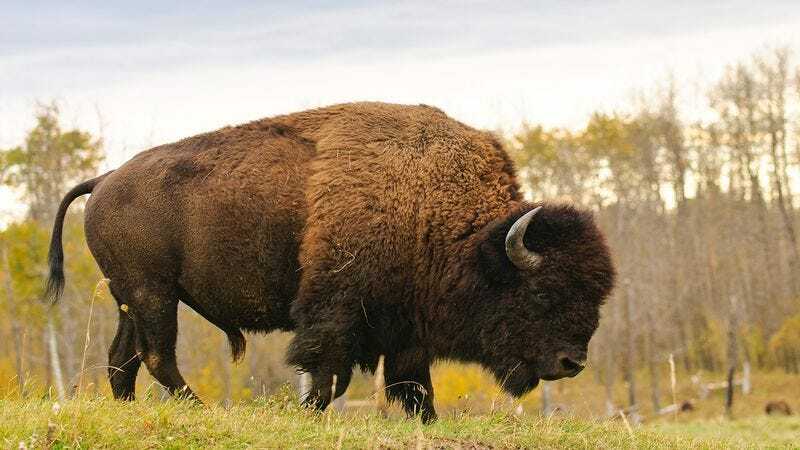 However, so much acreage was depleted in an effort to build higher and higher stacks that many bison habitats were left with hardly any grass for grazing, and herds everywhere succumbed to starvation. Experts believe that this challenge ultimately set species preservation efforts back by half a century. 5. The Thousand Pelt Challenge: While slaughtering a thousand bison and collecting their pelts to raise awareness for the millions of Americans who lack warm winter clothes might’ve seemed like a noble idea at first, in retrospect, this one was an unmitigated disaster. Even though only a handful of participants actually succeeded in killing all of the 1,000 bison they were challenged to kill, the odd hundred or two that most people did manage to slay slowly added up, and now it’s unclear if the species will ever fully recover. But on the bright side, the challenge managed to raise enough money to purchase over a million coats for America’s homeless. 6. The Bison Flip Challenge: It really didn’t get more fun than this one. All you had to do was figure out how to launch a bison up into the air and make it flip, and the physics of its bulky yet balanced frame would all but guarantee that it would land safely on its feet. After the first video of a bison flip went viral, millions of young people around the country started building all kinds of amazing trebuchets and hydraulic propulsion devices in order to create bison-flipping videos of their own. And while the successful bison-flipping attempts were endlessly entertaining and cool, the failed attempts were pretty brutal. Whether it was bison getting launched too high and exploding to bits in the blades of a helicopter, or a bison getting flipped into the branches of a tall tree and subsequently eaten alive by circling buzzards, the failed attempts at this challenge seriously harmed the American bison’s future odds of thriving as a species. Biologists warn that even one more viral challenge even tangentially involving bison could wipe them out completely, but with social media, there’s just no telling what’s coming next!